Os grid reference: SK1721 8347. 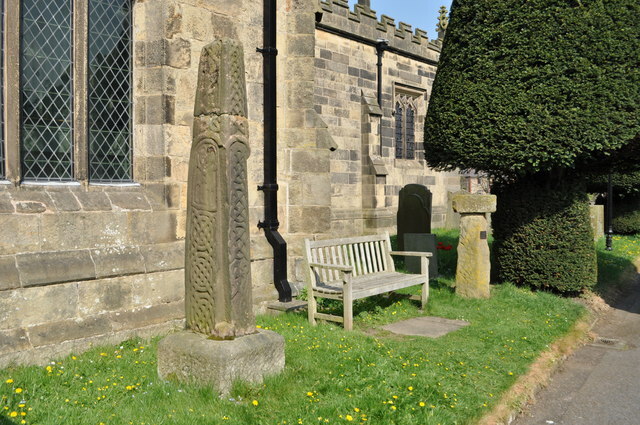 At the south-east side of the Derbyshire village of Hope stands the 14th century church of St Peter and the Hope Churchyard Cross, a late 9th century Saxon cross-shaft. There is also a medieval cross in the churchyard. The church is located on Station road at the east side of the village close by Pinder Road and, just a short distance to the east the river Noe flows into Peakshole Water. And 1 mile further east in The Hope Valley at Brough the scant earthworks of a Roman fort can be seen. The village of Castleton is 2 miles west on the A6187, Bamford is 3 miles to the north-east, and Buxton is 6 miles to the south-west on the A6 road. This 6 foot 6 inch sandstone cross-slab stands at the south-side of the church and is now set into a more modern square base. Said to date from the time of King Alfred, it was found in two pieces after being hidden-away in the wall of a nearby school-house until 1858, having lain there for safety since the Civil War. It is richly carved albeit a little weather-worn. All four sides have carvings in seperate panels, the best side being the east which has three panels; at the top there is knotwork, while in the middle two figures are holding up a large staff (or a cross), the lower panel having two interlaced rings surrounded by foliage. The west face is also exellent. Again there are three panels, the top shows a figure holding the cross above his shoulders, the central segmental-headed panel has two saints embracing, while the bottom one has three double concentric rings with double cords crossing ‘diagonally’ and interlinking over the rings. The north face has just two panels with snakes biting each other (top) and the bottom having four-cord plait design with interlacing; there is interlacing composed of figure of eight knots on the south face. Sadly the cross-head is long gone. Close to this is The Eccles Cross, dating from the Middle Ages. About a mile to the east at Brough, near Bradwell, in the Hope Valley are the earthworks of the Roman fort of ANAVIO. But there is little to see now apart from some low, grassy banks. Two Roman roads ran from the fort, one going to Buxton, the other to Melandra Castle near Glossop and Templeborough, near Rotherham. Photo: © Copyright Ashley Dace and licensed for reuse under this Creative Commons Licence. Sharpe, Neville. T., Crosses Of The Peak District, Landmark Publishing Limited, Ashbourne, Derbyshire, 2002. Bunting, Richard., Anglo-Saxon and Viking Derbyshire, J. H. Hall & Sons Limited, Derby, 1993. Categories: Ancient Churches & Chapels, Ancient Crosses | Tags: Churchyard Cross at St Peter's Hope in Derbyshire, Hope Churchyard Cross in Derbyshire | Permalink.